Creative party favors are a special way to let everyone get involved in the excitement of an engagement. 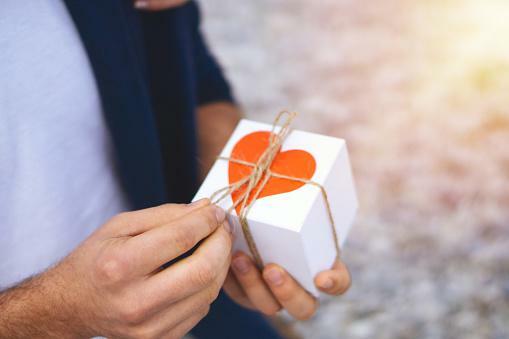 From fun and easy DIY options to affordable and meaningful trinkets you can purchase, there are lots of great ideas to make guests feel special at your engagement party. You don't have to be the crafty type to make your own favors. Try some of these cute ideas. 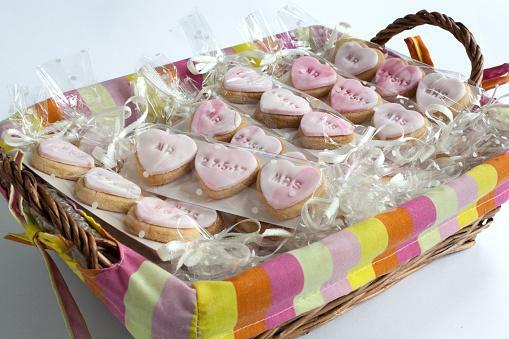 For a tasty favor, you can make personalized heart cookies that showcase the wedding date. You'll need a heart-shaped cookie cutter, cookie dough and icing, cardstock, and thin ribbon. You'll also need cellophane bags, such as Paper Mart's standard clear, flat bags, which retail for under $15 for a box of 1,000. In addition, you'll need alphabet and number stamps, such as these that sell for about nine dollars at Walmart. Start by making three sugar cookies per guest using refrigerated dough or your favorite recipe. After the cookies are cool, frost them with icing in the wedding colors. Before the icing has dried, use the letter and number stamps to decorate the cookies. Stamp a third of them with "Mr." and a third with "Mrs." Then stamp the remaining third with the wedding date. While you wait for the icing to dry, cut cardstock to the dimensions of three cookies and slip a piece of cardstock into each bag. Slide one of each stamped cookie into each bag. Tie the bags closed with a ribbon. Fill a handmade box with Hershey's kisses for a creative and sweet treat. To make this simple favor, you'll need construction paper in the wedding colors, scissors, double-sided tape, twine, and paper boxes. A good choice are the bon-bon boxes from Paper Mart, which retail for $22 for a case of 200. Fill the box with Hershey's kisses or another tasty candy. Cut a small heart out of the colored construction paper. If you want, write the couple's names on the heart, or you can leave it blank. Affix the heart to the top of the box with double-sided tape. Wrap twine around the box and tie it in a bow. Everyone loves gourmet popcorn! This favor is ideal if you're throwing a movie-themed engagement party, but it can also work for a party without a specific theme. 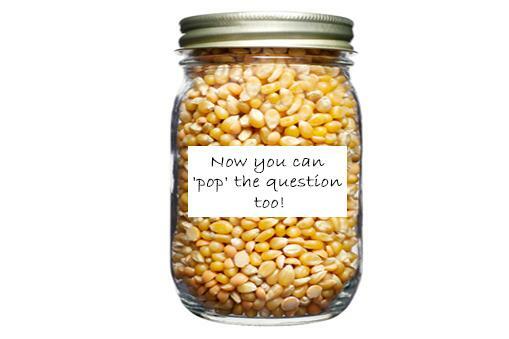 For each guest, fill a clear glass canning jar with gourmet popcorn. Use twine to attach a paper tag to the jar. You can find tags at any craft store, or purchase 100 plain paper tags for about $11 on Amazon. Write, "Now you can 'pop' the question too!" on the tags. If you'd prefer to buy favors for your engagement party, there are tons of great options available. You'll find something that's perfect for the happy couple and fits your theme and budget. Consider some of these great ideas. 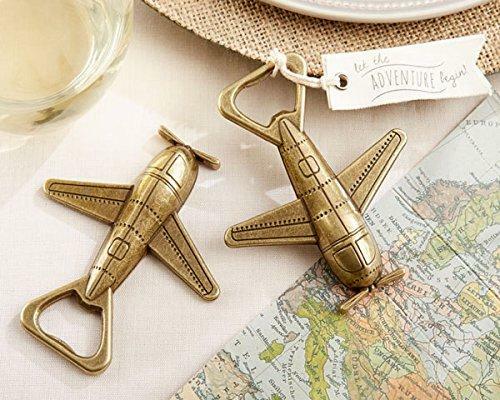 This adorable bottle opener from Wedding Favors Market is shaped like a miniature bronze airplane. A cute tag attached to the tail reads: "Let the adventure begin!" You can even personalize the tag with the couple's names or the date of the upcoming wedding. This is a great choice for a couple who loves to travel, and it makes a useful gift that guests will enjoy using for years to come. Price depends on the quantity you order, but they start at about $1.70 apiece. If you're throwing a party for a couple who loves writing or are teachers, personalized pencils make a great little gift for guests at the engagement party. You can purchase custom pencils from Beau Coup with your choice of message and graphic. Choose an engagement ring design with the couple's names and wedding date for a great favor. You can select from six different pencil colors. The personalized pencils cost about $22 for 24. A small candle is a classic choice for a favor, and it works especially well to play up the romance of an engagement party. You can make this traditional choice special and unique with a personalized label, which can also help guests remember the date of the upcoming wedding. The two-inch, frosted glass votive from Kate Aspen includes a custom label in your choice of pink, blue, or white. It comes in a lovely organza bag to make it even more special. The minimum order is 24 votives, and the price is based on quantity. They start at about $1.85 each. If the couple has set the date, help guests get a jump on plans by giving them a cute wooden magnet with the wedding date on it. Etsy seller Cork Country Cottage offers a design in the shape of a mason jar, which would be perfect for a vintage-themed engagement party. The custom magnets are made of wood and feature the couple's names and the wedding date. They retail for around $50 for 25 magnets. No matter which favor you choose, consider the personality of the special couple. 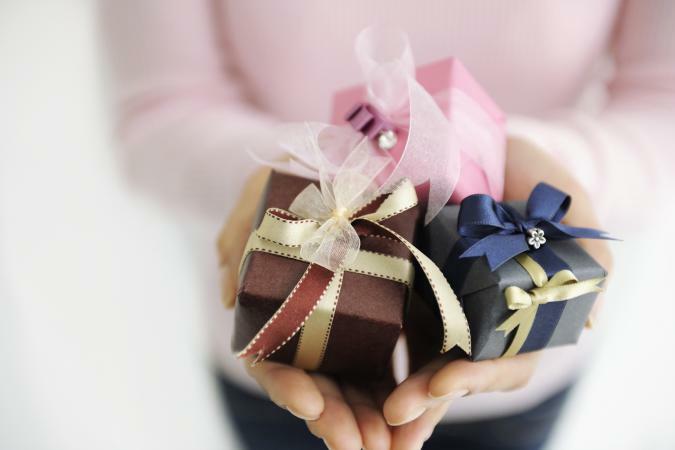 Favors that work with the couple's hobbies, interests, or unique characteristics will send the message that you put a lot of thought into this little gift.